The Dribble Taxi is a taxicab driven by Dribble and Spitz. It was remodeled from a regular taxicab by Dr. Crygor, and is able to turn into a spaceship and rocket through space. It has appeared in every one of Dribble and Spitz's stories. In WarioWare, Inc.: Mega Microgame$!, Dribble and Spitz first tune up the taxi at Diamond Taxi before picking up a customer, and the stage subsequently takes place in the taxi, with the music coming from the car's radio, the lives being represented by little Spitz dolls hanging from the car's roof, and the current level being displayed in the odometer. The colors in the taxi also change to the reflect the stage's difficulty. Of note is that the customer's fare is automatically set to $77,777 when Dribble turns it on. 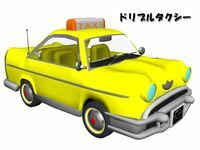 The taxi seen in space in WarioWare: Twisted! In WarioWare: Twisted!, the taxi is being driven by Dribble and Spitz again along Interstate 310 when Spitz starts playing around with its radio (this again sets the music for the stage). It then suddenly breaks down on the road, and Dribble and Spitz get to work repairing it. Whenever a microgame begins, the taxi's hood pops open and it zooms inside. During the stage, the taxi smiles when a microgame is won and gets angry when a microgame is lost. After completing all of the microgames, Dribble and Spitz transform the taxi into a spaceship and fly into space, where they pick up Ocktor. The taxi in WarioWare: Touched! In WarioWare: Touched!, the taxi brings in more characters to the plaza after the other levels have been completed. In Mike's story, Dr. Crygor uses the taxi to pick him up. In WarioWare: Smooth Moves, Dribble and Spitz are cleaning their taxi when Alien Mitzi asks them to take her to Tomorrow Hill, and Dribble promptly ferries her there. As in WarioWare, Inc.: Mega Microgame$!, the interior of the taxi is where the stage takes place, and the details from that game are repeated in this one (excluding the change in color). The taxi is also featured in Dribble and Spitz's story in WarioWare: D.I.Y. Showcase. The duo competes in the Diamond Rally Championship with it, ramming into the opponents' cars to flip them over and stop them from taking the lead. The intermission scene is a Diamond Taxi ad with Dribble, Spitz and the taxi, and the player may press to make it fall apart. The taxi is redesigned for this game. It now has a more curved hood with a slightly more elaborate silver ornament on it, four headlamps replace the license plate and there are stripes on the sides, as well as four round lamps spelling "TAXI" for a new top sign. These lamps act as the life counters, breaking as the player fails. In Game & Wario, the player takes control of the taxi in the minigame Taxi. The main objective of this game is to transport clients rescued from UFOs to shelters. The vehicle can transport three clients at a time. The exterior design is similar to the Smooth Moves version. The taxi's license plate number is shown to be 777-7777. Another first is the cab's roof door, from where Spitz aims and fires with his bazooka. The taxi returns again in WarioWare Gold. In this game, it is revealed that the taxi is customized with an Octoblazooka that Spitz can activate should the situation call for it. Dribble and Spitz's taxi in WarioWare: Twisted! Dribble and Spitz's taxi in WarioWare: Touched! Their taxi's bumper sticker says "Diamond Taxi 777-7777", which consists of seven sevens, a symbol of luck. While it has yet to be seen in a game, Dr. Crygor's schematics reveal that a map-reading prairie dog lives under the taxi's hood, serving as its navigator. ↑ 1.0 1.1 1.2 Nintendo. (March 20, 2003). "Secrets of the Dribble Taxi" Nintendo. Retrieved July 4, 2018. This page was last edited on September 27, 2018, at 13:41.